Spring Song; Lemminkainen Legends; Romance; The Dryad; Dance Intermezzo; Pan and Echo. EMI's Gemini series is a serious challenge to Naxos, Apex and Regis. A double CD set costs �7.99 at Amazon well below the �5 a disc gold standard for bargain price discs. Although, as it turns out, there are better choices for individual works this makes for a competent, generous and pleasurable Sibelius anthology with the accent on the lighter music. The two CDs contain all the Groves/RLPO Sibelius originally sold on three EMI vinyls issued 1973-75. This is their CD debut after almost three decades of neglect. Groves is not a conductor we associate with Sibelius; Bliss, Delius, Sullivan, Elgar, Arnold, Grace Williams, Walton and Coates, �yes� but not Sibelius. It was not his métier. Or at the very least his style seems out of sync with its spirit. It needs a chill, a freshness, a shiver, a luminosity that Groves does not quite attain. The most serious music here is the Four Lemminkainen Legends. They are early works whose profile has at last emerged from the fame of the symphonies. These are highly romantic, touched with a Nordic impressionistic brush, stark in the case of the Lemminkainen in Tuonela episode, cool and transcendent in the case of the most famous of the tetralogy - The Swan of Tuonela - which leads a concert life of its own more than the other pieces. In this connection Lemminkainen's Return is the next most likely piece for you to encounter away from the rest of the suite. It has been memorably done by Beecham although let's not forget Berglund. Groves takes 18.01 over the Maidens poem. Compare Ormandy (16.12), Stein (15.39) and Sinaisky (15.53). If you want a good inexpensive set of the Legends then go for Naxos (Sakari) or Virgin Classics with Paavo Jarvi (the latter at about �7 in the UK). Horst Stein is also extremely good and lacks nothing in atmosphere and passion - a Decca twofer 452 576-2 that should be in the essential collection of any Sibelian. Also exceptional is Ormandy's revelatory 1979 recording on EMI still sounding superb. In the light music the ample string body gives a Palm Court air to the proceedings. The moods, delicate and robust, are a Scandinavian echo of Elgar's numerous popular genre miniatures. Even in the 'anger' of the Pièce caracteristique from Suite champetre there is no serious emotion - no depths probed. Oddly enough a smaller string complement might have produced a better effect. Groves' In Memoriam though notable for some shuddering outbursts dallies between security and instability; too tentative for its own good. There are no concessions to theatre or parade ground grief in this piece. The Tempest music, like everything else from these sessions, was beautifully recorded and this set does it better justice than the original LPs. However compared to Beecham (Sony) Groves is superficial. Compared to Boult's Tempest Prelude Groves' is rather too refined and Groves loses full touch with the angry emotional pulse. I am being far too negative here as there are also some lovely moments (try tr. 14 - the entr'acte) but the magnetic pull is towards the generalised rather than the sharply etched. When I compare this lovingly recorded version with the mono Sony the affable but not bumbling Beecham delivers one imaginative coup after another - surprising and delighting in music that is already familiar. Groves pleases but neither terrifies nor delights; the emotional compass is narrower. 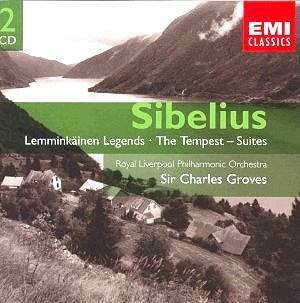 This is an exceptionally well recorded collection showcasing Groves' Sibelius adventure with the RLPO and EMI Classics in the early 1970s. In audio terms when first released the Lemminkainen Legends trounced the competition - the Jensen version on Eclipse or Ace of Clubs and the Lukas Foss/Buffalo Phil on Nonesuch. That said, EMI, faced with a choice between recording the Sibelius symphonies with Groves in Liverpool and Berglund in Bournemouth, understandably chose Berglund. On their own terms these tracks are well worth hearing and having. I do not regret the purchase but this is not special. If your preferences in Sibelius run to the more relaxed, smooth and loquacious then Groves will be for you and this set will satisfy.